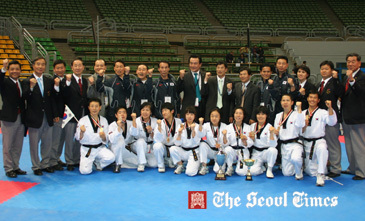 After winning the overall title, Korean athletes and officials pose after the closing ceremony of the 4thWTF World Taekwondo Poomsae Championships the Hall 1 of the Cairo Stadium in Egypt on Dec. 2, 2009. The 4th WTF World Taekwondo Poomsae Championships wrapped in a resounding success for good reasons in Cairo, Egypt on Dec. 2, 2009. The three-day championships, which took place at the Hall 1 of the Cairo Stadium, attracted a total of 564 athletes from a record 59 countries. Korea won nine gold medals and one silver to clinch the overall title of the championships, followed by Vietnam with two golds, one silver and three bronzes. Iran came next with one gold, five silvers and five bronzes, while Spain followed with one gold, one silver and eight bronzes. Germany finished at fifth with one gold and two bronzes. Italy also won one gold and two bronzes, while the Philippines captured one gold medal. The Best Referee Awards of the championships went to five referees: Mr. Jong-joo Kim of Korea, Mr. Jose Luis Gonzalo Morales of Spain, Mr. Kostas Kaloudis of Greece, Mr. Ahmed Mahmoud Rizk of Egypt, and Ms. Elba Monroy Garcia of Mexico. Korea’s Jae-yoon Ahn, the gold medal winner in the men’s 2nd master division, was selected as the Best Male Athlete of the championships, while the Best Female Athlete honors went to Maria Giovanna Chiappelli of Italy, the gold medalist in the 2nd fair division. The Active Participation Prize was shared by Brazil and Russia, while the Good Fighting Spirit Prize went to Kenya. The third and final day of the poomsae championships featured five categories. In the women’s 1st master division, for those between 41 and 50 years, Korean Young-ae Seo succeeded in defending her title for the fourth straight time. The silver went to the United States’ Dure Chang. The bronze went to Spain’s Yolanda Ubero Alcaiz and Germany’s Turner Imke. In the men’s 2nd senior category, those between 31 and 40 years old, Korea’s Jin-han Lee won the gold medal, while Egypt’s Abdel Fattah Metwalli settled for the silver. The bronze went to Spain’s Pedro Campillo Frontera and Iran’s Hatami Mohammadtaghi. In the women’s 2nd senior division, Korea’s Suk-kyung Lee earned her country the gold medal, while the United States’ Akiko Reyes clinched the silver. The bronze was shared by Fatemeh Asadpour of Iran and Chi Lin Wu of Chinese Taipei. A trio of Vietnamese athletes, Trung Anh Le, Emma, and Dinh Toan Nguyen, earned their country the gold medal in the men’s 1st team category, for those between 41 and 50 years old. The silver went to Turkey’s Ucan Ibrahim, Mevlut Pekcun, and Karisik Fazil. The bronze went to Spain’s Alberto Jo Lee, Jose Manuel Ramon Salguero, Jose Luis Estudillo Vela and an Iranian trio of Hamid Nazari Gharehchomagh, Ali Salmani Azarkhavarani, and Akbar Forouzan. In the women’s 1st team division, three female athletes from the Philippines, Rani Ann Ortega, Francesca Camille Alarilla, Ma. Carla Janice Lagman, won the gold medal. The silver went to Vietnam’s Tuyet Van Chau, Thi Huynh Mai Duong, and Thi Thu Ngan Nguyen. The bronze was shared by Egypt’s Rohanda Mohamed Ammar, Menna Tallah Montasser El Kaissy, and Salma Mohamed El Wakeel, and Spain’s Maria Teresa Camino Ortega, Particia Camino Ortega, and Emma Camino Ortega.